A dental implant is a small, man-made titanium fixture that serves as the replacement for the root portion of a missing natural tooth. The implant is placed in the bone of the upper or lower jaw and allowed to bond with the bone, serving as an anchor for the replacement tooth. Dental implants can be used to replace a single lost tooth or many missing teeth. 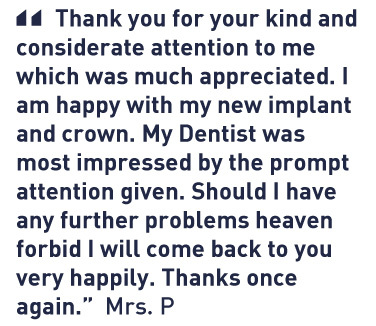 Implant supported replacement teeth look, feel and function like natural teeth. Our team of dedicated implant dentists includes some of the top dental surgeons around who all have the advanced knowledge, education and experience to make sure your implant placement and aftercare is as easy and comfortable as possible.